Two heavyweight album releases in a 5 days period from two artists/bands who have marked forever, in one way or the other, the now 30 to 40 year old in the middle of the 90s, two artists/bands whose former albums were issued in 2007, so four years ago (tell me if I'm wrong, time is a fluctuating matter), let me tell you... well, I don't really know what I wanna tell you. PJ Harvey and Radiohead are both busy since the end of the 80s and issued their first albums in the early 90s, and both are still big hot hype news 20 years later, as much among the picky music lovers than for the average Joe (or almost, concerning PJ Harvey). It is hard to find other artists in the past who succeeded to last that long while at the same time keeping the esteem from rock critics, music lovers and anyway having several albums stamped platinum in their discography. U2 and The Cure were already old news 15 years after their debut, Pink Floyd and Led Zeppelin were filed as obsolete after the punk period,... it's possible I forget someone. I can only imagine some month of February 2021 where both Arcade Fire and The National would both release an album in a 5 days period, hoping for them they'll be still there and not made obsolescent by some musical revolution, or by their own contribution. No matter what, Radiohead and PJ Harvey are still there and front page, wherever, and there have been some musical movements in between time. Sometimes they were influenced by it, sometimes they borrow from it and most of the time they ignored it to go their own way. And both always tried and are still trying, for better or for worse, to evolve, to change direction, take another point of view, experimenting, being adventurous, taking risks. I would like to mention that I'm no Radiohead fan, but I have to say that since a little more than ten years no 90s band or artist succeeded as well as Radiohead, despite a level of popularity that maybe only U2 can share, and overdo (and Coldplay, and Muse... whatever, they're ten years younger than Radiohead anyway, and already repeating themselves like old farts). I choose to keep the connection with U2 for a little while. Some people will scream "blasphemy", others will whisper "of course", and most of them for the wrong reasons, in my opinion. I just know for a fact, and for being some kinda witness, that U2 is generally despised by the 90s generation, a bit like Led Zeppelin was during the 80s. Both Radiohead and U2 shared a similar stadium rock attitude spiced with emotional and anthemic songs and performances. Both bands made their signature album and biggest success, artistically and commercially, at the same moment in their career ("The Joshua Tree" in 1987 for U2 and "OK Computer" in 1997 for Radiohead) to turn their back on it a little bit later and experiment with electronic dance music, more the dance part for U2 (jumping in the train wagon of the dance music which was emerging then for some times, quite like The Rolling Stones did during the disco era) with "Achtung Baby" (1991) and "Zooropa" (1993), the electronic part for Radiohead (the twin albums "Kid A" in 2000 and "Amnesiac" in 2001). U2 never abandoned their anthemic stadium rock poses and songs, and they exploited their new goldmine as long as it was possible. Radiohead overthrew about everything, from their very recognizable guitars sounds to the very emotionally highpitched sad voice of their frontman and singer Thom Yorke. Then both bands slowly decreased the electronic part in their music to get closer, these new influences in their luggage, to their original sound. Thom Yorke reconciled with his own voice and stop distort or deform it in Radiohead next albums. Actually, Radiohead never stopped experimenting with electronics but they also allowed themselves to remind everyone they are one of the only three guitars rock bands. But where U2's guitars, played near exclusively by The Edge (maybe the most recognizable guitar sound ever, to the level of gimmickry), never really changed and evolved (except on "Zooropa"), Radiohead's guitars evolved enormously while still keeping their idiosyncratic sound, from grungy on "The Bends" to Led Zeppelin-like on "OK Computer" (Jimmy Page was a huge influence on U2's "The Joshua Tree" as well) to something more and more unique and genuine, arching back to Johnny Marr (The Smiths, a.o.) through the sixties and forward in time till now and beyond. To me, Jonny Greenwood is one of the most inventive guitarists ever heard on records, besides being an multi-instrumentist, and he doesn't feel the need to put his guitars all over the place. Honestly, I've got no idea how the last U2 albums sound, I just read enough that they are the same old U2 with some modernization here and there. I've got some fun with the single "Vertigo" some years ago, one of their rockiest songs ever, but it was too clear they were then jumping back on the new wagon of some punk pop/rock revival with bands like The Libertines and The Strokes and plenty others. To me, the similarities between U2 and Radiohead have more to do with the shape of their career then their "art" and surely their "intentions". And where U2 seemed always a bit late in assimilating new music influences and tend to remain a step behind all novelties, Radiohead was and still is more prompt to incorporate new musical concepts and ideas coming from the outside. And one other difference is that for the last ten years Radiohead, contrary to U2 in the 90s, doesn't take over commercially successful new musical genre, they don't try to emulate and be part of some fashion or hype, they let themselves influenced by this or that and take what they want in it and not what the market or some record company would like them to take. Besides, Radiohead is a completely independent band, no record company attached, they were among the first to publish their albums on the internet. Now when I write "more prompt", it really means they are quick but after someone else. Radiohead has never come with something new, only influences. For example, mixing guitars with glitch electronic music and polyrhythmic dance patterns into a song format was already done by German band The Notwist on the album "Shrink" in 1998. Further, most of the electronic sounds on "Kid A", "Amnesiac" and later albums are strongly reminiscent of Aphex Twin, Autechre and Board of Canada. Some examples concerning what could sound new for the general audience in Radiohead music. Now if we begin to list all their influences, it will be never ending. And one huge strength of Radiohead is that, for ten years now, all these influences are near impossible to pinpoint in their production, no song sounds like this or that artist. This was one of my complains for the last PJ Harvey's album "Let England Shake", too many songs just sound like what some other artists do... better. I always believed that in order to create something genuine and personal musically, either listen to the most musicians and music genre possible, or listen to genres alien to what we are creating ourselves, or listen to nothing but the world around us : Radiohead are in the first category, from jazz to glitch, Penderecki or Messiaen to Neil Young, Neu! and Can to hiphop, and they've decided to put all these influences into their music. It could sound like some monstruous fusion muzak, but it sounds like Radiohead. Now after this (over)long introduction, what about "The King of Limbs"? This is the most brainy, pensive, ethereal, linear, abstract, personal and homogenous Radiohead's album, it's even maybe their best, time will tell. Paradoxically, it's their most rhythmic, if not polyrhythmic, album in their career. It's also their least enjoyable. Like I said earlier in this review, I'm no Radiohead fan, that band has always been peripherical, but I also realized that I own all their albums, except the very mediocre first one "Pablo Honey" as well as compilations and live recordings. From "The Bends" in 1995 to this very last opus, I always enjoyed their albums from beginning to end, I'm moved and thrilled, enjoying the sound, the rhythm, the melodies, and maybe what I really do enjoy the most is the huge melancholy if not despair that sweats out of all their albums. To me, they are the closest to Joy Division without sounding like them, again they're just an influence among plenty others, they're no Interpol nor even The National (and I really love the later). On every Radiohead's albums there are always songs I really do enjoy more than others, songs I could be obsessed with, and generally these are the most guitars oriented, I just love their guitar sound. lately, in the last ten years, songs like "Knives Out", "There There" and "Weird Fishes/Arpeggi" really do the trick and they come out pretty regularly in my own little compilations. 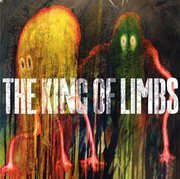 "The Kings of Limbs" contains no such songs, and surely no all guitars out ones and even if the guitars appear on most of the songs, but in a very discreet near subdued manner. This last album is also their most electronic, even more than "Kid A" and "Amnesiac" but here too, it's everywhere but almost whispering. Then there is the drums. Radiohead's got one of the best drummer of his generation with Phil Selway, extremely souple and groovy, no flashy technical solos, no hardkicking toms dude, he's more part of the Charlie Watts/Larry Mullen, Jr family and doesn't sound like any of them, just like Mullen doesn't sound like Watts. Well, one can really hear Phil Selway drumming, if very straightforward and repetitive, on the very last track "Separator". The rhythm part is maybe the most striking part of the album, compared to past ones, they near always seem sampled (from their own source, I believe) and looped in a very mechanic and repetitive way. It reminds me of the 'motorik" à la Neu! but contrary to the Germans who remained very boom-tchack 4/4 pattern, Radiohead's drum loops are polyrhythmics, very busy, close to Jungle and mixed rather low on each song. These loops also near never stop, and after some times it brings a sense of tension, sometimes upsetting, in the general slow and floating soundscapes. The last song called "Videotape" from the previous album "In Rainbows" contains such kind of repetitive drum pattern. This song, maybe the best on that album, was already showing what will come next. These repetitive drum loops which is working against the song itself, like some ghostrider on a highway, can also be found on one Elbow's song from their 2003 album "Cast of Thousands" : "Grace Under Pressure" (http://www.youtube.com/watch?v=u5xZ-Qej8Ro), even if the drums part seem to be played live and not looped. By quoting Elbow, I could summarize this whole review of "The King of Limbs" by "grace under pressure". Contrary to the instruments and the arrangement in general, where everything seems rather dreamy, Thom Yorke's voice has never been so upfront in the mix, with very few effects nor compression, he's actually the only solist, and he uses his voice like an instrument, a horn, and there's something close to jazz in that. The song "Bloom" which open the album is a striking example of the jazz influence on this album. The bassline could come from a Wayne Shorter or Miles Davis album from the end of the sixties, or maybe better from Eric Dolphy's "Out To Lunch" : http://www.youtube.com/watch?v=7tnPkQufnZY. On that same track, there are some echos of horns appearing and disappearing, like waves, somewhere between Toshinori Kondo's prepared trumpet and The Blue Nile "From A Late Night Train" : http://www.youtube.com/watch?v=cV9P3yJLeIU. Some music from the sixties comes out quite regularly in this album, in a very discreet fashion, these are influences and inspiration, and surely not trying to sound like this or that artist. While so many present day artists are falling into that 80s revival, even PJ Harvey on her last album, and with seldom satisfying results (the last Destroyer album "Kaputt" is one of these very rare exceptions that absolutely transcend its prominent influences), Radiohead once again, and for the last ten years, aren't falling into any revival or whatsoever hype. If there's a hype linked to them it's because they are the source of it, they are their own hype. And on this album, the late sixties jazz had an influence, as well as sixties rock with Sterling Morrison or Lou Reed guitars in the third album by The Velvet Underground, and Scott Walker string arrangement. I begin with the later on the song "Codex". That song can be compared with others on previous Radiohead's albums, an extremely simple piano driven melody, very repetitive, like softly striking the same chord four or five times, then stop, then striking again, some kinda Radiohead trademark : "Pyramid Song" on "Amnesiac", "Sail to the Moon" on "Hail to the Thief" and of course "Videotape" on "In Rainbows". On "Codex" the piano sound is slightly distorted, deformed, with some effects, but the result is quite similar : another very melancholic and touching song, haunting and dark. At exactly 3:34 minutes into "Codex", a string arrangement appears out of nowhere and repeats its movement about three times before vanishing slowly again. The whole passage last a little bit over 20 seconds, and it's overwhelming. Scott Walker used a very similar string arrangement in 1968 for the song "Plastic Palace People" : http://www.youtube.com/watch?v=ayrS74ktTyE but also on "Patriot (a single)" from Scott Walker 1995 album "Tilt" : http://www.youtube.com/watch?v=y3HrunSlv4w. Once again, no copy, an influence, and 20 seconds in a song. And finally, the extremely soft, cristallin guitar which appears both times on the left channel of the sound spectrum on "Morning Mr Magpie" and "Separator" is very much influenced by the guitar found on some songs from the 1968 album "The Velvet Underground", especially "Pale Blue Eyes" : http://www.youtube.com/watch?v=Nir4BnNIFmg. Concerning the electronic parts in "The King of Limbs", I won't be surprised these guys listened to some Four Tet and especially Flying Lotus album "Cosmogramma", on which Thom Yorke contributed vocals on one track : http://www.youtube.com/watch?v=KvZmd1ceCLY. All in all, it's hard to get better influences than that, and if they are incorporated with such taste and discretion into the whole creation process, I can just applaud frantically. Radiohead is not your average British band for sure, they keep on being interesting after twenty years of existence, but more than interesting they keep on being crucial in their persistence in producing high quality music with its doses of emotions without resorting to easy pathos. Besides, if they are the sum of their parts, at least one part of them, Jonny Greenwood, profiles himself as an extremely talented and versatile fellah. The soundtracks for the movie "There Will Be Blood" was composed by him and it's one of the most striking movie soundtrack I've heard in my life, for its power and subtlety, but also for its innovation, the music being another character in the movie, a narrator and it's closer to 20th century classical music than a movie soundtrack. And I believe his influence on Radiohead good health is very important, maybe more so than that of Thom Yorke. I've got one complain concerning this album, this is the sixth album to be produced by Nigel Godrich and I was already suspecting his role to be quite similar to George Martin for The Beatles. In both cases, it's quite difficult to fathom who's doing what, who's really bringing the most original ideas, sounds, arrangement into the whole process. In between time, George martin's role has become quite clear, he was the real creative mind behind the Fab Four, one can mostly notice it on the second side of The Beatles' "Abbey Road". Indeed, he alone finished the album after these four chaps left the studio after another argue, and the result is like nothing The Beatles ever done before, and maybe the first time songs flow into each other in the history of rock and pop music, besides the very peculiar arrangement. All that has been credited to The Beatles, but it wasn't them. So what about Nigel Godrich? The giant step between "The Bends" and "OK Computer" clearly got his mark, but how far? And the same with this new transformation of the band on "The King of Limbs". I would like Radiohead to make at least one album without him. But well, Nigel Godrich is almost considered as a sixth member of the band. maybe I could also ask them to play without Thom Yorke, or Jonny Greenwood. Maybe it doesn't matter. Next review will be for far less famous artists, and shorter, I promise.